A 27-year-old Londoner has become the youngest ever Briton to reach the South Pole on foot. Adventurer Tom Avery suffered frostbite to his face during the 702-mile expedition, which ended with a final 31-hour trek. After reaching his goal he said: "Coming to the South Pole is a dream I have had since I was around eight years old, and to finally achieve it is indescribable." Mr Avery was part of a team which also included Patrick Woodhead - who is just one month older. They began the trek 100 years after Captain Scott's first expedition to the Antarctic. Mr Avery, who works for a ski company, and Mr Woodhead, a television production assistant, battled exhaustion, 30 mph Antarctic winds and temperatures plunging as low as minus 30C. The British Centenary Expedition also includes Canadian Paul Landry, 45, and South African Andrew Gerber, 28, who has become the first South African to make it to the South Pole. Speaking by satellite telephone Mr Avery said the team had pitched a tent around 20 yards from the Pole. "It really hasn't sunk in yet," he said. "We have just got the tent up and put our feet up, so we're all very well. "We have gone through the night without sleep so we are pretty bushed." Mr Avery said weather conditions were "pleasant" for the final stretch of the expedition. Before walking the last few miles to the South Pole he said: "There is not much wind, a few clouds and a temperature of around minus 20C." His father Julian, 57, said: "This has been an aim of his for many, many years and I think Scott and Shackleton have really been his heroes." Mr Avery said that in June 2000 Tom led an expedition to mountains in Kyrgyzstan, and named two previously unscaled peaks after his mother, Quenelda, and the expedition's patron, Ranulph Fiennes. The four men began their journey from the Hercules Inlet in the Chilean Antarctic on 17 November. It followed months of intensive training, including mountaineering in New Zealand. They will now be picked up by a twin-engine Otter aircraft and taken back to their base camp at Patriot Hills in the Antarctic. The team have skied to their goal, pulling sleds loaded with equipment and supplies weighing over 100lbs. They hope to raise �500,000 for children's charities and The Prince's Trust. 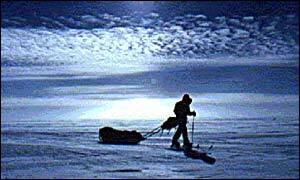 "He became the youngest Briton to reach the South Pole on foot"
"I feel very relieved to finally be at the South Pole"